One thing that seems to cause more confusion than anything else in the camping and caravanning world is the issue of what we are legally allowed to tow, and what regulations we need to comply with, when we do. The aim of this guide is to strip away all of the jargon, to explain, as simply and concisely as possible, just what, exactly, the law is, and how it affects us on a day to day basis. A lot of the confusion seems to arise from the use of so many different terms and classifications of the various ‘weights’ involved, so we will be looking at those in a little detail, as well, to try and clarify some of the major issues that people seem to be struggling with. Gross Laden Weight means the weight of a vehicle or trailer including the maximum load that can be carried safely when it is being used on the road. It will be listed in the owner’s manual and is normally shown on a plate or sticker fitted to the vehicle (the VIN plate). The plate or sticker should, also, show a Gross Train Weight (see below). This is simply another term for Gross Laden Weight. When referring to caravans, you will, often hear the term; Maximum Technically Permissible Laden Mass. (MTPLM). Also commonly known as MAM, this is the term most commonly used in towing legislation. It is, however, simply yet another term for Gross Laden Weight. It is, also, sometimes, referred to as Maximum Allowed Mass. This is, simply, the maximum total weight of the towing unit, plus trailer, plus load. The usual definition of kerb weight is taken as a vehicle, in its ready to use condition, with all standard tools, spare wheel, oil and a full tank of fuel. Many manufacturers, however, are now adopting EC Directive 95/48/EC which defines kerb weight as; ‘a car, in ready to drive condition, with the fuel tank 90% full, a driver on board, weighing 68kg and luggage of 7kg’ (Slightly random allocation of weights, admittedly, but that is the current definition, for EC purposes). These are the ONLY legal limits that determine what we can tow. Much is made of the guidelines quoted by the main camping organisations, based on a percentage of the towing vehicle’s kerb weight (more on that later). Whilst these may be sound advice, it is important to realise that these are just recommendations. In the majority of cases, you can legally tow more than this, but, with some vehicles, the legal limit is less, so it is always best to be clear on exactly what your car is allowed to tow. The weight and nature of trailer you can tow, will, ultimately, depend on the date on which you first passed your driving test. The important thing to remember here, when looking at what we can tow on our driving licence, is that we work on the maximum weight a car COULD be (as stated on the VIN plate) NOT the actual weight of the combination. This is known as the MAM (Maximum Authorised Mass). This is a very important distinction, as so many people think you need to work on either kerb weight, or actual weight, neither of which is correct. If you passed your car test before 1 January 1997 you are allowed to drive a vehicle and trailer with a combined weight of 8,250kg (8.25 tonnes). This is the MAM, and, hence, the weight of a vehicle or trailer including the maximum load that can be carried safely when it’s being used on the road. Once again, actual weights are not relevant here. OK, very confusing, so what does that actually mean? The key thing here is the weight of the trailer. If the MAM of the trailer is 750 kg, or less, then a combined MAM of 4,250 kg is permitted (3,500 kg vehicle, plus 750 kg trailer). If the trailer exceeds 750 kg, then the combined MAM we are allowed is reduced to 3,500 kg. For example; if your vehicle has an MAM of 3,200 kg, and you trailer has an MAM of 600kg (total: 3,800 kg MAM) that IS legal, because the trailer MAM is less than 750kg, and, hence you are allowed up to a total of 4,250kg. On the other hand, if your vehicle has an MAM of 3,000 kg, and your trailer has one of 800 kg, that is NOT legal, even though they have the same combined MAM. The distinction is that the MAM of the second trailer is over 750 kg, so the combined MAM is reduced to 3,500kg. If you want to tow a trailer weighing more than 750 kg, when the combined weight of the towing vehicle and trailer is more than 3,500 kg, you’ll have to pass a further test and get B+E entitlement on your licence. You’ll then be able to tow trailers up to 3,500 kg. OK, so that looks almost identical to the rules for anyone passing after 1997, so what’s the difference? Well, if you look at the first bullet point, it states; “small trailers weighing no more than 750kg”. What that, basically, means is that there is no longer an upper limit on combined weight, if the trailer is a small one. In reality, that distinction is academic, because a standard car, we can drive on a B licence can’t be more than 3,500kg, anyway, so the effective limit of 4,250kg remains the same, by default. As with any other licence, those passing prior to 1 January 1997 are, relatively, free of restrictions, however, those passing after that date may well have some, depending on the nature of their licence. There are two main classifications of HGV licence; HGV Class 1, and HGV Class 2. For our purposes, the main distinction is that a Class 1 HGV licence, also, adds +E to all of the licence categories. In other words, a post 1997 HGV Class 1 driver may tow an outfit with a combined MAM of more than 3,500kg. A post 1997 Class 2 driver, on the other hand, will not have the E classification on their licence, and will face exactly the same restrictions, when towing as any other post 1997 licence holder. For obvious reasons, many consider this to be unreasonable, bearing in mind the weight combinations a Class 2 HGV driver is allowed to tow, when actually driving an HGV, however, that is the way the law works. If in any doubt, you can go to the Gov.uk web site, and check out one of their online tools. If you enter your basic details, it will tell you what you can legally tow. If you enter your licence details, here, the site will tell you everything about your licence, including what you can legally tow, any endorsements, etc. If you hold a full B licence, then you are allowed to tow, with a combination exceeding 3,500kg, provided you display ‘L’ plates, and there is someone with a full B+E entitlement sat next to you in the car. Their full attention must, also, be on the road, and they must not be asleep, reading, or, otherwise, distracted. This provisional entitlement only applies in the UK, and you cannot do this if driving abroad. There seems to be even more confusion and misconception over the legal limits for a vehicle than there is over those for drivers. There is one very key distinction, we need to be aware of, when calculating what a car can legally tow. In this case, we are looking at the ACTUAL weight of the trailer, not the plated MAM. In other words, if our car can, legally, tow 1,500kg, and we are towing a caravan with an MAM of 1,600kg, but an ACTUAL weight of 1,400kg that IS allowed. The key measure we need to be aware of, when calculating our vehicle’s maximum legal capacity is that of Gross Train Weight. This is specified by the manufacturer, and represents the maximum allowed weight of the vehicle, plus trailer, plus load. Whatever the specified GTW is, that is the total allowed combined weight, and must not be exceeded, under any circumstances. The manufacturers will, often, also, specify a maximum towing weight, which is, of course, the GTW, minus the weight of the car itself. This is usually specified in the car’s manual, or V5 document. It can, also, be calculated from the vehicle’s VIN plate, but that is not absolutely guaranteed. To the right is a typical VIN plate. This can, usually, be found on the door pillar, or under the bonnet. It will, normally, contain five main pieces of information. 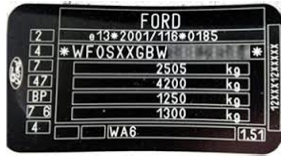 Firstly, it will contain the Vehicle Identification Number (VIN) and, hence, the name of the plate. Below that are four weights. The top weight is the Maximum Gross Weight (MGW) of the vehicle. The second is the Gross Train Weight (GTW) and the latter two are the allowed weights on each axle. OK, so how does that help us? Well, the second number (GTW) tells us the absolute maximum that the car, trailer and full load are allowed to weigh. The top number (MGW) is the maximum that the car, alone, with full load, is allowed to weigh. Logically, therefore, the difference between the two is the maximum allowed weight that the car is allowed to tow. In the example above, the maximum towing capacity of the car is 1,695kg (4,200kg – 2,505kg). A quick word of caution, here; this represents the maximum towing capacity when the car is fully loaded. For the vast majority of vehicles, this will, also, be the maximum legal towing capacity of the car (and it is what the police or DVSA will work on, if they stop you) however, for some vehicles, this will not, in fact, represent the maximum towing capacity. A small minority do not work on this basis. If in any doubt, whatsoever, then worth checking what the braked towing limit is on your V5 document. Nine times out of ten, it will be the same as your VIN plate, but always worth checking, as it may be more. If there is no specified limit on the V5, then we are best working off the VIN plate. This legal limit pays no heed, whatsoever, to the kerb weight of the towing vehicle (which many consider to be the legal basis for vehicle towing weights). The main towing organisations, including the Caravan Club and Camping & Caravanning Club both specify 85% of kerb weight of the towing vehicle as the recommended maximum towing weight of any trailer or caravan especially for those who are new to / not entirely comfortable with, towing, however, many still believe that this is the maximum legal limit, which, of course, it isn’t. OK, so this can create a number on anomalies, and is, no doubt, one of the key reasons why there is so much confusion on this matter. Let us, by way of illustration, take a look at two completely different vehicles. The figures used are approximate, and for illustration purposes only. In this scenario, we can, clearly, see that the actual legal towing limit, of 3,500kg is more than double the recommended ‘safe’ figure. Whilst the 85% recommendation is there for a reason, and we would not question its validity for a second, it is important to remember that it has no basis in Law, whatsoever, and this explains why will often see one Land Rover towing, for example, another, identical Land Rover, on a trailer, which, obviously, by definition, must exceed the 85% guideline. In this second scenario, we have the opposite, and far more serious situation. In this instance, we have the issue of the 85% rule giving us a figure that is actually over the legal limit. In this case, the unwary driver could apply the 85% rule, believing themselves to be legal, when, in fact, they are not. Hmmm. So, if this causes so much confusion, then why use kerb weights at all? Well, to be honest, this practice is coming under increasing criticism, as outdated, and not in touch with modern vehicle improvements and specifications. That said, it does still have a degree of relevance, but ONLY for caravans. This is because they have very different handling characteristics, compared to all other forms of trailer. If you think about it, a caravan is a large, high sided, non aerodynamic block, with low internal density and high centre of gravity. This makes it much more vulnerable to external influences, such as cross winds and over taking lorries, making it more prone to snaking and other handling problems. If this happens, then you need a relatively heavy tow car, in order to prevent the ‘tail wagging the dog’. If you passed your test after 1 January 1997, you need to take an additional test in order to be able to tow anything. – Not true. Even if you passed your test after that date, you can still tow a vehicle up to a combined weight of 3,500kg (as above). I cannot legally tow anything that weighs more than 85% of my car’s kerb weight – Again, not true. The 85% figure is purely a recommendation, and, whilst it is prudent to always keep it in mind, it may well be considerably less than the actual legal limit. I know that the 85% rule is just a guide. The legal limit is actually the kerb weight of the car. – Yet another very common misconception. Kerb weight is not relevant to the car’s legal ability to tow. I always stick to the 85% rule, because that is what bodies like the Caravan club argue is safe, so, if I exceed that, and have an accident, I could be prosecuted for driving dangerously, even though I was under the manufacturers’ limit. – We’re hearing this increasingly at the moment. At the risk of repeating ourselves, yet again, the kerb weight has no legal bearing. Provided you are within the manufacturers limit, have not loaded in a dangerous fashion, and are within the constraints of your own licence, you are not going to be prosecuted for dangerous driving. (This advice becomes somewhat less relevant if you were also eating a pizza and texting at the same time). You should stick to 85% of kerb weight, so that the car can brake properly. Nope! The car’s ability to brake has nothing, whatsoever to do with its own weight. Indeed, a heavier car will have more inertia, and put even more strain on the car’s braking system. The car’s maximum towing capacity isn’t a legal figure. It’s based on its ability to tow a weight up a 12% gradient (or a random selection of similar gradients). No. Really, not. The car’s maximum legal towing capacity is based on a large number of factors, including engine power, transmission, suspension, fuel type, etc. It would be ridiculous to base a car’s legal towing limit on what it can tow up a 12% gradient, if, for example, the brakes were not up to the job of stopping that weight within a safe distance. This figure is very much a legal number, and represent the maximum that vehicle is allowed to tow. I’ve loaded my car and van to the maximum, so I now need to get down to the local weigh bridge to see if I’m within the 3,500kg limit for my post 1997 licence. Afraid not. Again; actual weights have no relevance, whatsoever, when looking at what we can tow on our licence, only plated weights. For anyone passing their test after 1997, the weight of the trailer must not exceed the weight of the towing vehicle. Again, not true. This was the case, when the legislation was first introduced, however, this restriction has now been lifted, and the trailer can, now, be heavier than the towing vehicle, provided it is within the specified towing limit of the vehicle, and, also, within the 3,500kg combined limit. Obviously, it goes without saying, that, when determining what you are legally allowed to tow, you will always look at the minimum figure. In other words; it is no use towing a 3 ton trailer which is within your car’s towing limit, if it is in excess of what you are allowed to tow on a post 1997 licence. As with all things, common sense is key here, and, if in doubt, it is always best to check, as the consequences of failing to tow within the law can be quite severe. An often over looked figure, nose weight is very much a legal parameter, and should not be ignored. It has two key elements; the maximum allowed nose weight of the trailer, and the maximum nose weight of the car / tow bar. Again, it goes without saying, we need to take the lower of the two, when calculating our own legal limit. The car will have a nose weight limit, based, largely, on the ability of its tow bar and suspension to support that weight. The caravan will have a nose weight designed to give optimum balance, and, hence, handling. Where we are unable to obtain a figure for nose weight for the caravan, the common practice is to take an average of 7% of the laden weight of the caravan (typically 75 – 100kg). The easiest way of verifying this is with a purpose made nose weight gauge, however, a low cost, but effective, alternative is to use a length of wood, under the hitch, and placing it on a set of scales. Any trailer weighing more than 750kg must be fitted with a satisfactory braking system. This comes in to play, either when the towing vehicle brakes sharply or if the trailer becomes disengaged from the tow hitch. A full schematic of a typical trailer braking system is shown below. The easiest way to tell if a trailer is braked is to look at the hitch itself. In between the coupling head and the towing shaft, there is a rubber concertina sheath, which flexes as the towing vehicle slows down or speeds up. As the vehicle begins to slow, the inertia of the trailer keeps it coming forward. The sheath flexes, and the towing shaft is pushed backwards, where it engages the overrun lever, thereby applying the brakes. 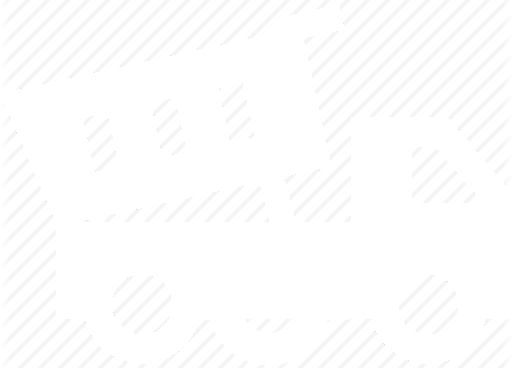 Likewise, if the trailer becomes separated from the tow bar, the car will pull on the breakaway cable, again, engaging the overrun lever, and braking the trailer. If there is a rubber sheath, hand brake and breakaway cable, it means your trailer is braked, otherwise, it isn’t. If it isn’t, it is a legal requirement to fit a safety chain, so that the trailer cannot become fully detached, if it should, accidently, disengage from the tow hitch. Below a Gross Laden Weight of 750kg, there is no legal requirement for overrun brakes, though many trailer tents and small folding campers have them fitted, regardless. It goes without saying, of course, that any brakes fitted to a trailer / caravan must be in sound working order. Most of us are aware of maximum weight limits, even if we're not 100% sure what they are. Many, however, are not aware of any legal limits on the external dimensions of the trailers and caravans they are towing. The maximum trailer width for any towing vehicle is 2.55 metres. (This was 2.3 metres, prior to 2010). The maximum length is 7 metres for a trailer towed by a vehicle weighing up to 3.5 tonnes (3,500 kg). This excludes the towing hitch / draw bar. Anything longer must be towed by a commercial vehicle, weighing over 3,500kg. If you get a tow bar for any modern UK car, it needs to be ‘type approved’. This means it meets EU regulations and is designed for your car. A type-approved tow bar will have a label with an approval number and details of the vehicles it is approved for. You must have an adequate view of the road behind you. 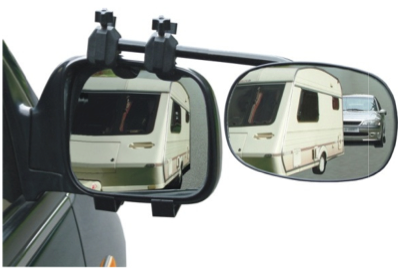 If your caravan or trailer is wider than the rear of the towing vehicle, you will need to fit suitable towing mirrors. Contrary to popular misconception, the actual offence is not failure to fit towing mirrors. The offence you can be penalised for is that of not having an adequate rear view. The diagram, below, clearly, shows the field of vision required by law. You must be able to see 20 metres behind, to a width of 4 metres. 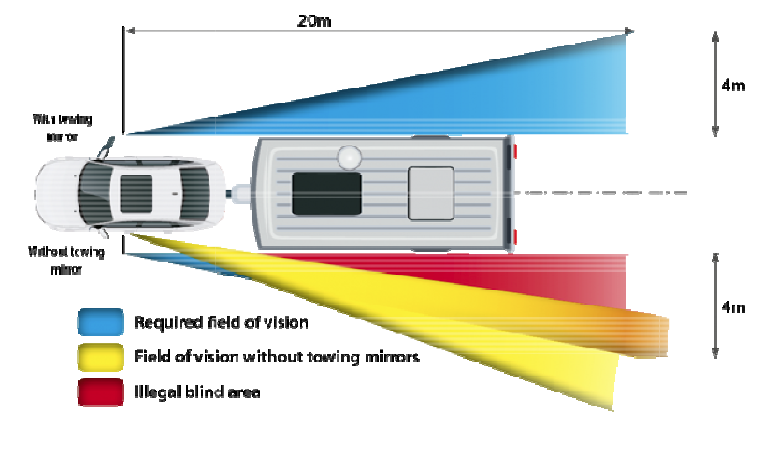 This is only possible, without mirrors, if the towing vehicle is wider than the caravan. There are a couple of other things we should be aware of, in respect of towing mirrors. Firstly, it is illegal to have them fitted, when not towing. Secondly, it is possible to render you vehicle illegal, by fitting them, even when you are towing. These two facts are related, due to the limit by which towing mirrors are allowed to protrude from the towing combination. 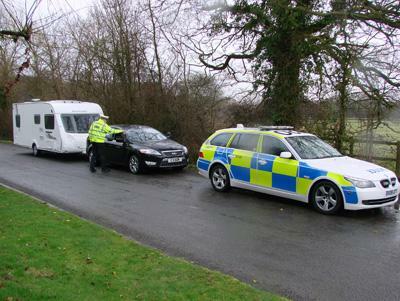 Under current law, in order to prevent your tow car from becoming an additional hazard, on the road, it is illegal to have any towing mirrors that protrude more than 25cm beyond the car or caravan. (Prior to 26 January 2007, this was 20cm). Obviously, once you remove the caravan, the mirrors will protrude more than 25cm beyond the side of the car, which is why it is illegal to fit them to a car when not towing. Of course, this, then gives us another issue, that many people are unaware of. In exactly the same way as having no caravan will render us illegal, by default, so will having a caravan that is narrower than the towing vehicle. (This is, usually, more relevant when towing with a larger, Transit Van, style vehicle). Most, if not all mirrors will protrude more than 25cm beyond the side of the vehicle, which makes it even more important to understand the law, rather than, as many do, blindly stating; “You must always use towing mirrors, when towing. It’s the law!” No. It isn’t, and, in certain cases, fitting them may render your vehicle illegal. You must display the same number plate as your towing car on the trailer. According to the legislation; if you tow more than one trailer, fix the number plate to the trailer at the back. (It’s in the legislation, so, presumably, it must happen!!). Also, it’s easy to forget, on a trailer or caravan, but the number plate must be illuminated at night. In fact, the number plate must be capable of being lit, even if the trailer is only used during daylight hours. Whilst you may (no guarantees) get away with using a temporary number plate when collecting the trailer for the first time, you must get a ‘proper’ plate as soon as possible, as failure to display one is, also, an offence. UK suppliers must ask for ID and proof of ownership, prior to issuing a number plate. allowed in the outer lane, at all, not even to overtake. In a three lane carriageway, we are not allowed in the third lane, in a four lane carriageway, we are not allowed in the fourth lane, and so on. "It is sort of correct as the C1E bit is limited to 8250kg." This is irrelevant as B+E is different vehicle class than C1E. The article says vehicle not cat B Vehicle. The article is trying to cover all of the pre 97 cats not just BE. I have asked the author to change it to make it clearer but not sure if that will filter down to the article. B 3500kg vehicle & either a 750kg trailer to a total of 4250kg OR a combined plate weight of 3500kg. BE pre 19-1-2013 is 3500kg vehicle & any plated weight of trailer with the real weights within the vehicles GTW. BE post 19-1-2013 is 3500kg vehicle & 3500kg trailer with the real weights within the GTW. just to clarify for everyone. B vehicle - upto 3500kg gross weight. So the nub, a CAT B vehicle with the right train weight (e.g. downplated 7.2 ton)can tow much heavier road legally on a pre-2013 BE licence than a C1E can. That is an interesting point. A full C1E would still be the same tow weight as the pre 2013 BE as the GTW of the C1 would be the same in both cases & the C1 vehicle can its self be more than the B so a greater total load capacity. Also I would assume that the down plating of the MAM would also down plate the GTW / GCW but still cant find any hard facts. Also remember that all trailers over 3500kg mlpm must have active brakes not overrun brakes. For info, for vehicles type approved under EU WVTA class N, such as recent Defenders, the tow bar does not need to be type approved. A spot of rapid research makes it clear that the linked document specifically and exclusively related to vehicles which have been type approved as N1 unde the ECWVTA scheme and are then subject to modifications prior to first registration. The linked document outlines the modifications which are and are not within scope of the IVA process which would be required in this case. The linked document refers to the Road Vehicles (Approval) Regulations 2009 (http://www.legislation.gov.uk/uksi/2009/717/pdfs/uksi_20090717_en.pdf ) and, as far as I can deteremine, indicates that for a former N1 vehicle that has been converted and is presented for IVA, the coupling device itself is regulated but the means of attachment to the vehicle is not specifically so. The relevant part seems to be Item 50 of Part 1 of Schedule 5 of RVAR 2009 which states that the coupling device must conform to "The technical provisions of: Annex VII to Directive 94/20/EC." (whatever this may say) and "Vehicle Installation: Securely attached to structural parts of the vehicle and in such a position to allow the safe functioning and operation of the coupling." So no mention of specific type approval for the means of attachment. As far as I can tell, nothing in either source (and in fact nothing that I am aware of) alters the basic situation that a vehicle that has ECWVTA N1 classification and is unmodified to the extent that IVA is not required prior to registration does not require that any towing attachment is type approved. Please do not however take this as any sort of qualified legal guidance, it is just my personal interpretation of ridiculously complicated legislation produced by people whose sole purpose seems to be to make life difficult for all of us! spelling errors, many spelling errors! If it has ref to 94/20 then its out of date as the reg that applies is Reg55. Again not my area so not to be taken as gospel. It is also worth noting that most towbar sellers seem to imply that Reg55 does apply to commercial vehicles. I would guess that if you can buy a bar it will either a, be approved or b, not need approval or they would not sell it.